Are you ready to celebrate and get all the candles? Will you become the best cake-maker of them all? But to do this you can’t leave the cake without decorations and you can’t let all the cherries escape. Remember, however, that it’s not easy being a cake-maker: throw the dice, look at what you have to do and then, quick… try to position the cherries. Easy? Well…. Maybe with the rubber bands binding your fingers and your opponents next to you, you won’t feel quite so agile. 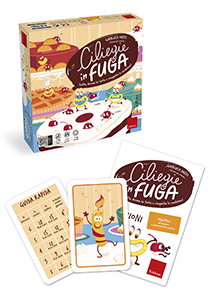 Cherries on the run… is part of the Playing to grow series, a new line of board games, conceived by Gianluca Daffi, which combine the pleasure of playing together with the opportunity to develop one or more specific executive functions: emotional self-regulation, response inhibition, working memory, focused attention, planning and flexibility. Quick, decorate the cake and collect the candles! Throw the dice, figure out what you have to do and then quickly... put the cherries on the cake. Who can be the fastest baker of all? CHERRIES ON THE RUN is a game from the «Playing to grow» series, created by Gianluca Daffi, an expert in child psychology and university professor. Each game focuses on specific executive functions or cognitive processes with the goal of aiding their development through play. CHERRIES ON THE RUN, in particular, develops skills of attention and emotional self-control. 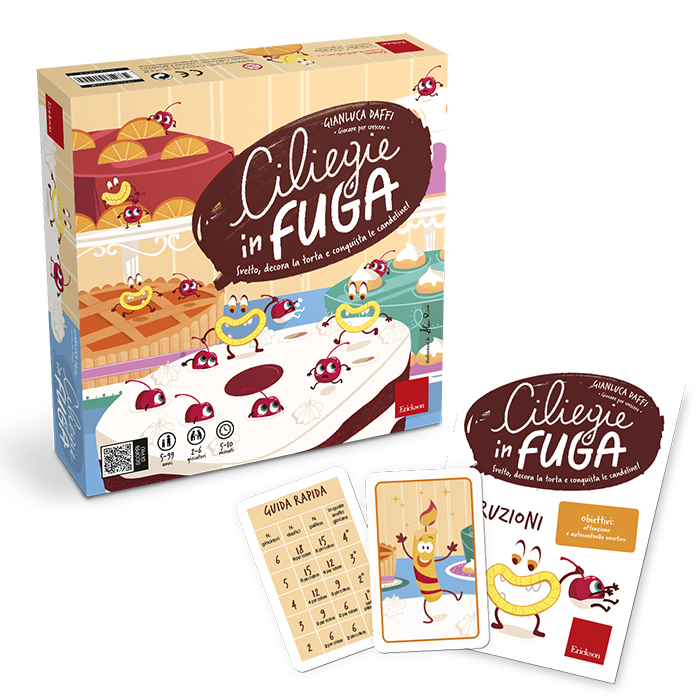 The objective of the game is to quickly place the cherries on the cake based on the indications of the dice, in order to earn more candle cards than your opponents. 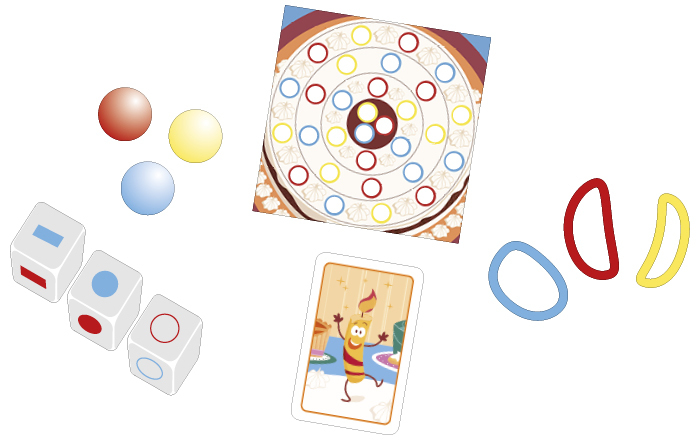 The game is composed of: 1 “cake” game board divided into 4 concentric circles; 15 little cherry balls (5 yellow, 5 red, and 5 blue); 18 elastic bands (6 yellow, 6 red, and 6 blue); 10 candle cards; three dice. To begin, insert the “cake” game board into the box andplace it in the centre of the table. Place the little balls and the elastic bands in the lid of thebox. Prepare the materials in the box based on the number of players as indicated in the following“gameplay chart”. The blue and red cherry balls and the blue and red elastic bands are represented on the dice by their respective colours, while the yellow cherry balls and the yellow elastic bands are indicated by blank dice faces. The player, looking at the three dice, must remember the missing colour, yellow, and deduce which element that colour refers to. Players who do not succeed in taking correct coloured elastic or cherry ball, or those who do not place the cherry ball in the correct coloured hole in the correct ring on the cake are eliminated. After each round, play passes to the next ring of the cake, working inwards, reducing the number of elements in play. The last player remaining in the game earns a candle card. At this point,	the game starts again from the beginning with all players. The winner of the games is the player who collects the number of candle cards established at the beginning of the game.